Hummus in Arabic literally translates to mean chickpeas. That’s exactly what this mezze is all about.A combination of crushed chickpeas, tahini (sesame paste) some lemon juice,garlic and olive oil…And Voila a delicious dip to serve with grilled meats,crisp pita or even some chopped vegetables. 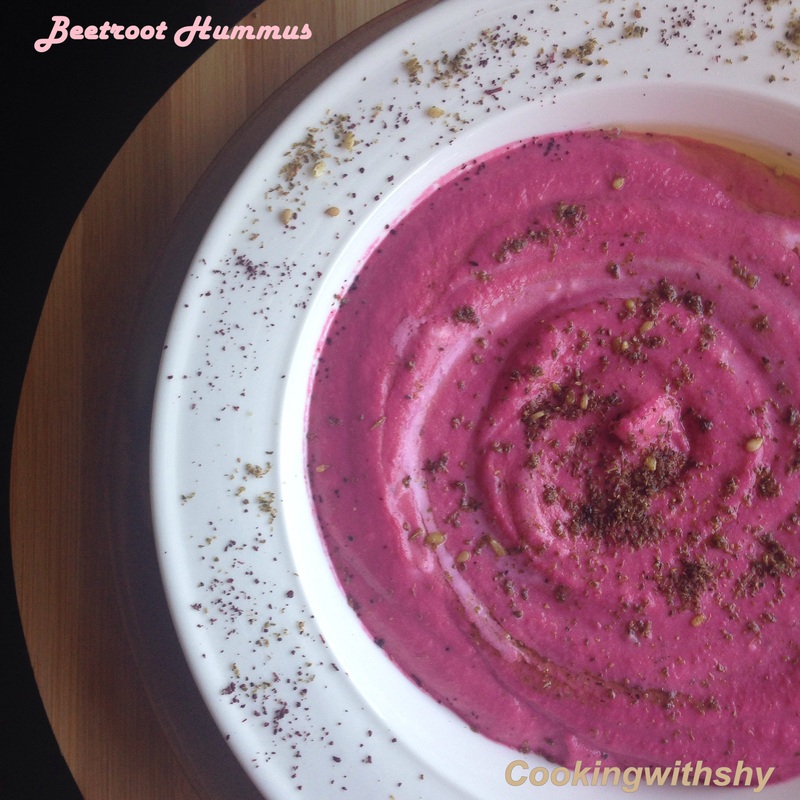 How about Jazzing up your favorite Hummus recipe with the goodness of beetroot? I’ve used some beetroot puree into a batch that I made up earlier this week. The beetroot totally livened up the hummus and gave it a wonderful texture, sweetness and a gorgeous color of course.The base recipe for the Hummus is pretty much a standard one. It was almost all gone and I had to reserve some to take a quick picture for this blog post. Put the chickpeas into a food processor and blend for a minute. Now all ingredients (except yogurt ) and blend further for 3-5 minutes till the mixture is smooth. Place in a small bowl and whisk in the yogurt. Drizzle some more Olive oil and sprinkle some sumac or zaatar powder. anything to swap sumac with?